I really like alphabet posters. I don't actually own any, but I love the idea of celebrating letters in their individual form and I'm also a fan of typography. Children's alphabet books take this idea one step further, and the letter-inspired illustrations are usually incredible. The very basic idea of letters driving a narrative is wonderfully obvious, and it becomes a great teaching tool for children and people learning languages. For adults, though, the world of alphabet-inspired literature is pretty thin, but James King's Étienne's Alphabet fills that void with its dictionary-style story. Étienne's Alphabet is the story of Étienne Morneau, a man who was orphaned shortly after he was born and subsequently brought up by nuns. His early life was spent entirely in Montreal, but then the orphanage closed and he was moved to Toronto, which is where he is when the story begins. In the present day of the novel (1967) Étienne has been out of the orphanage for several years and is working as a bank teller at Royal Bank. He rents out an upstairs room from the Beaulieu family, other Montreal transplants. And that is essentially his life. 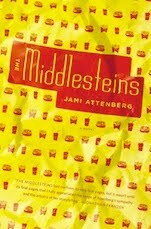 Étienne moves between work and his home life – he becomes quite close with the family – and everything goes along as usual. And then he's sent to Shanghai by his boss. Étienne has never traveled and all he knows about China is based on Tin Tin comics, so it is rather skewed. Nonetheless, he boldly buys a camera and sets off for foreign lands. He's there for several weeks (working on wheat imports or something) and he and his guide Chang spend off-work hours visiting different parts of the city, where Étienne takes photos. Sadly, but the end of the trip, his camera is smashed and his work is all destroyed, but he returns to Canada with a newly-discovered creativity and a friend in Chang, someone who Étienne worries about constantly. At home, Étienne starts to draw. He keeps his hobby secret, but little by little, it becomes a passion that takes over his every spare moment. Étienne ties each painting to a letter of the alphabet, and after his death (which is announced at the very beginning of the story) Madame Beaulieu is so overwhelmed by the work that she calls the Art Gallery of Ontario. Étienne is declared an undiscovered genius, which gets the ball rolling for the publication of his autobiography (which makes up the bulk of the novel). It seems that not only was Étienne holed up in his room drawing and painting, but he was also writing his life story. And, because of his obsession with letters and the alphabet, his autobiography took the shape of a dictionary, with pieces of his life scattered through each of the different letters. This is really my favourite part of the book. At the beginning of each new section, Étienne describes the personality of the letter he's about to embark on, and each one becomes its own sort of character, colouring all the vignettes and anecdotes that follow. It's strange to read a novel with a structure that isn't primarily chronological, but it works because the dictionary format is so familiar. Not that this is a straightforward dictionary; rather, it's an alphabetical breakdown of Étienne's life, with key words used to introduce important moments and memories that he feels are defining. In that way, it isn't definitions of individual words, but definitions of him. 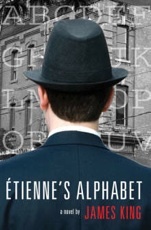 Étienne's Alphabet is a strange book to read because it is just so very different than most novels you come across. But King has a background in biography and knows just what sorts of snapshots will make a life compelling, which smoothes over the choppy form so that you don't even notice it after a few sections. Really though, it's the descriptions of the individual letters that tell Étienne's story because they offer so much insight into his character. I'm not sure I ever quite buy him as an artistic genius, but he is nonetheless someone worth spending time with because of his ideas about the emotional life of letters – those little characters we use so frequently we cease to think about them. Étienne forces us to pay attention, colouring our reading of his life and then giving us something to think about when we put pen to page (or finger to keys).